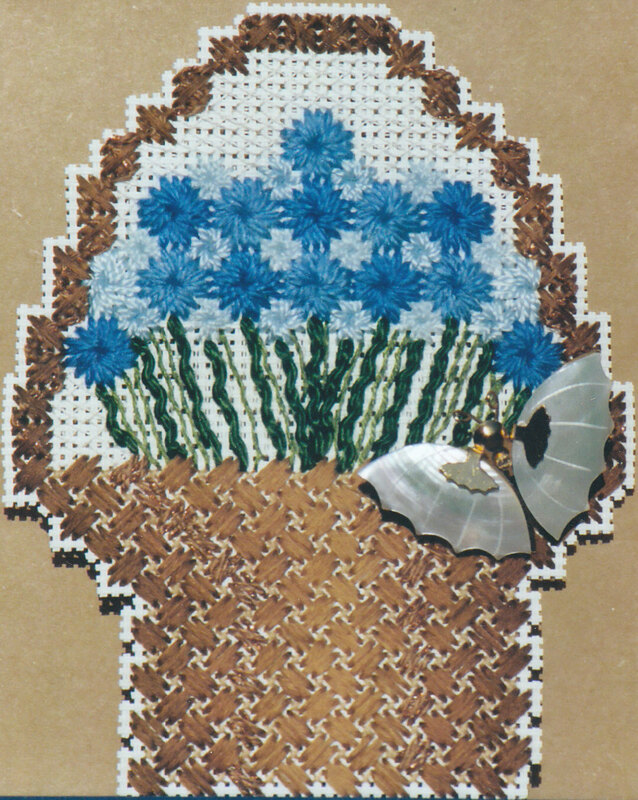 This is the sixth & last of the Butterfly Basket series & is a “Pinsations” original design & stitch selection. The pin is added to the piece so that the pin can be removed, worn, & replaced. The flowers are a combination of Colonial Knot + Lazy Daisy + Straight Stitch + French Knots + Stem Stitch. The basket is probably something I made up to be like the Spider Web stitch only with vertical spokes for the basket & a circular portion for the rim. And, I do not go back under one rather I did an over under & pushed tight together. It used a lot of thread. 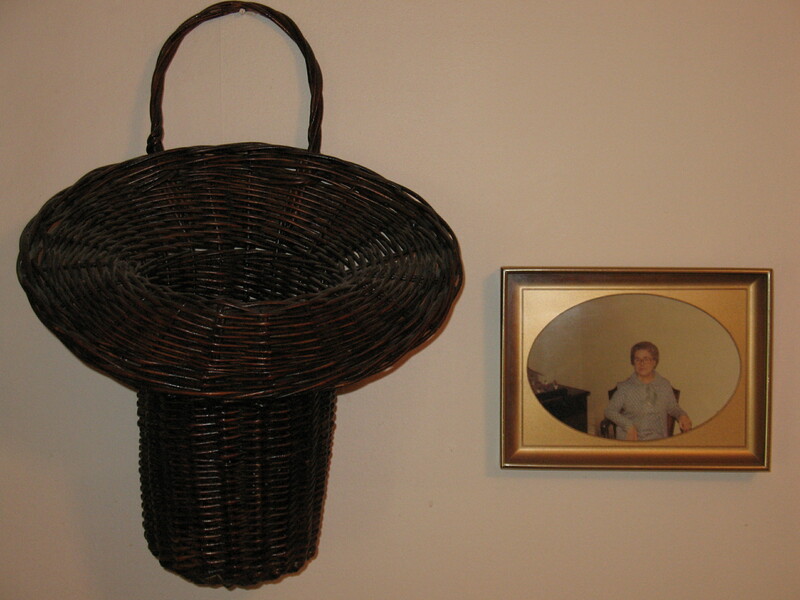 This basket was modeled after a basket that was my grandmothers, Mae (yes, that’s her in the picture). It is a woven wicker basket with a glass insert to hold flowers (I took them out so you could see the basket). I didn’t quite get the slope to the rim that I wanted. But, I haven’t figured out what would work better – perhaps someday I’ll try again. I’m not sure why I switched off the brown except that I liked that overdyed thread with the flowers. Stitches To Go by Suzanne Howren and Beth Robertson. The Needlepoint Book by Jo Ippolito Christensen. from Elegant Stitches by Judith Baker Montano (a dozen pages are dedicated to combination stitches). 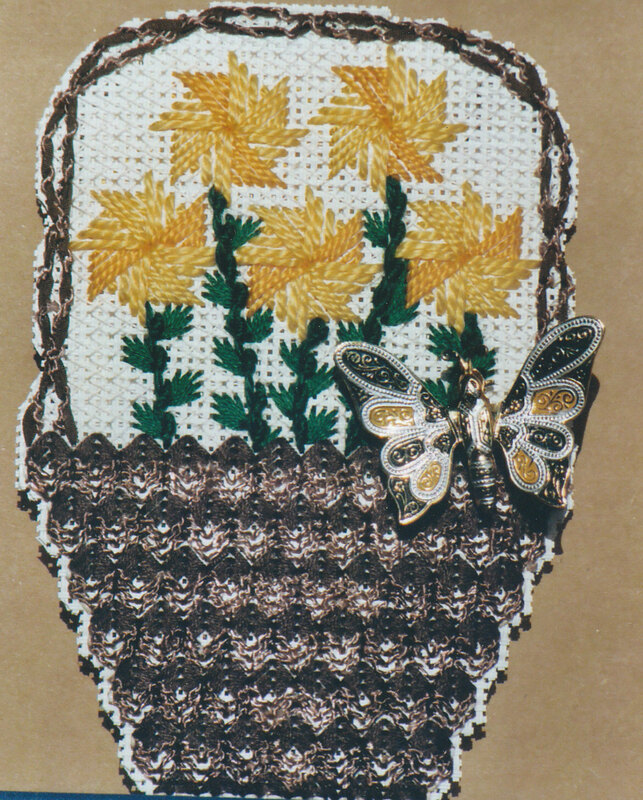 This is the fifth of the Butterfly Basket series & is a “Pinsations” original design & stitch selection. The pin is added to the piece so that the pin can be removed, worn, & replaced. 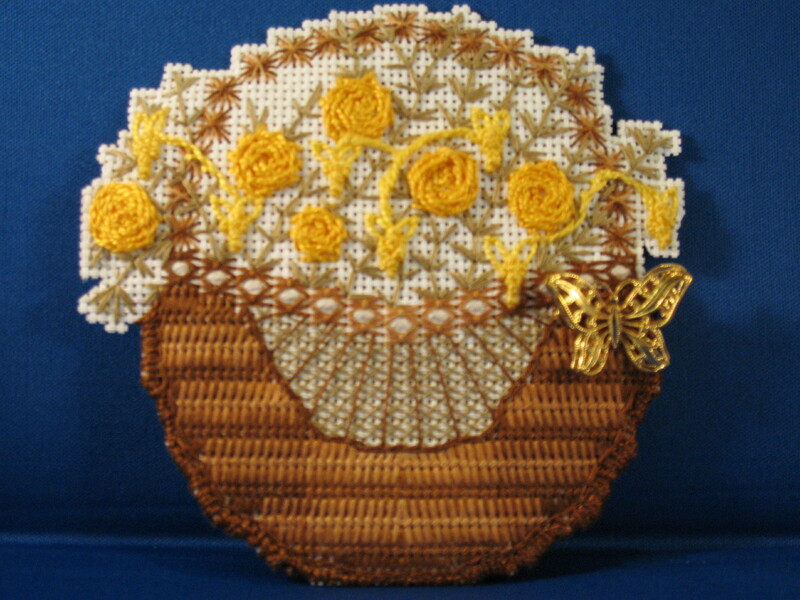 The darker yellow flowers are Rambler Rose and the lighter yellow flowers are a combination of Lazy Daisy + French Knots. The basket is Tied Gobelin. The stem is Fern with variations in length for curves. I still used several shades of brown DMC floche to get some depth to the basket. For the edging around the basket, I used 2 rows of Wheat Stitch. This is the fourth of the Butterfly Basket series & is a “Pinsations” original design & stitch selection. The pin is added to the piece so that the pin can be removed, worn, & replaced. The flowers may be double layered cross. The basket is Criss-Cross Hungarian (same as Basket 1). I really like that stitch for the weave you expect to see in a basket & for shading although I used different threads (mix of DMC floche & a Vineyard Silk). Not sure about the stem. 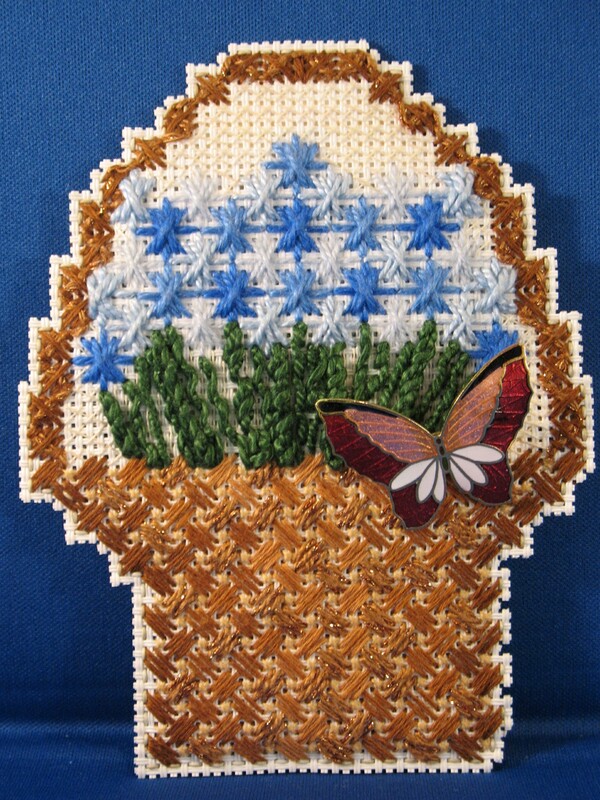 This is the third of the Butterfly Basket series & is a “Pinsations” original design & stitch selection. The pin is added to the piece so that the pin can be removed, worn, & replaced. I don’t know what I used for the flowers or the background – but I won’t repeat that selection. The basket is Alternating Cashmere with Tent. I like the little extra variation in the shading from just the alternating cashmere in this basket. It is subtle but when threads are placed in opposite directions, the light does reflect differently. I used several shades of brown DMC floche to get the effect of depth to the basket. 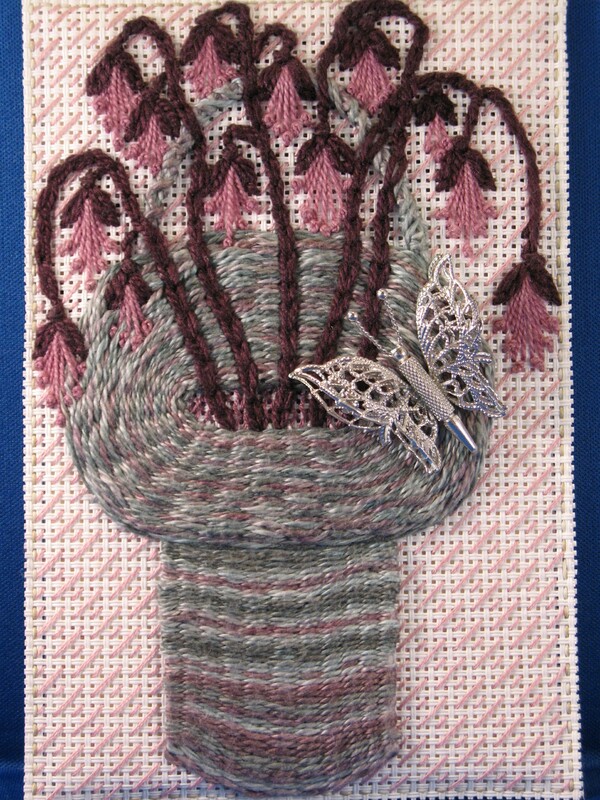 This is the second of the Butterfly Basket series & is a “Pinsations” original design & stitch selection. The pin is added to the piece so that the pin can be removed, worn, & replaced. The flowers are Milanese Pinwheel. The basket is Perspective. The stem is Ray. As in the first basket, I like the shading. I used a light and a dark brown boucle to get the layered effect. The butterfly picks up the yellow & brown. 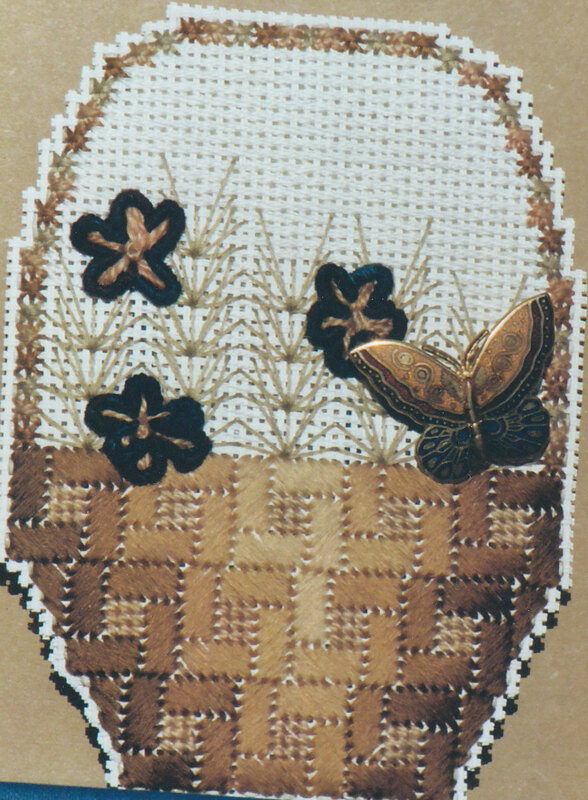 This is from my Butterfly Basket series & is a “Pinsations” original design & stitch selection. The pin is added to the piece so that the pin can be removed, worn, & replaced. The flowers are Daisy. The basket is Criss-Cross Hungarian. The stem is Whipped Stitch. I especially like the shading in this basket. I used a thread blending technique with several shades of brown DMC floche to get an effect of some depth to the basket. from Elegant Stitches by Judith Baker Montano.